Like many tourists and visitors of the city, you will want to buy souvenirs to take home with you. Instead of buying those from street vendors, go to the souvenir section of a large department store; there you will find genuine Russian crafts products, works of great beauty and elegance. When you buy something which is a copy or imitation of an old work of art, you must have a certificate to prove that it is not of special cultural value and therefore subject to the special rules for the movement of valuables across Russian borders. Purchases of souvenirs and presents costing less than $10,000 are not liable to customs charges at the border, provided that you are not intending to use them for commercial purposes. If your purchases are of special cultural value, you will need a certificate entitling you to export cultural valuables; this should be obtained for a fee from the Ministry’s of Culture regional office for the preservation of cultural valuables (Malaya Morskaya Street, 17; tel: 311-03-02). There is a limit of 10 on the number of souvenir coins made of non-precious metals that may be taken out of the country by a single person. Export of souvenir coins made of precious metals is not permitted. 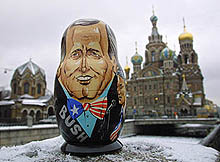 When you buy traditional Russian souvenirs from a stall, you automatically lose the opportunity to appeal to a state supervisory body in the event of a conflict situation arising. You also risk being deceived as to the status of the object which you are buying, which could result in you making a false declaration at the border when you are leaving the country. St. Petersburg's many non-food markets may, for all their abundance of goods on sale, involve you in unpleasant situations. You may, for instance, have poor-quality goods dumped on you or be cheated when making payment. How to tell an honest trader from a trickster? Your main weapons here are your common sense and your attentiveness. Keep a close eye on all movements made by the seller. Always be the last one to count any money. Bear in mind that what the trickster needs is for the money to come back into his hands so that he may use sleight of hand to perform a swap. When you have re-counted your money, put it away immediately in your wallet or pocket; do not allow it to be wrapped up or put in an envelope by the trader. It may happen that when you are unable to find what you are looking for at the market or in a shop you are approached by someone offering exactly that thing. Furthermore, this person assures you that he lives nearby and has the item in question at home. He invites you to come and look, and leads you into the doorway of an old house. In such old houses there are usually many connecting doors opening not into apartments but into other doorways, stairwells, or onto the street. Often such doors are indistinguishable from doors to apartments, and it is this that opens up opportunities for tricksters (sometimes, in order to make the resemblance with an apartment door even more convincing, the door is lined with leather substitute, fitted with a lock, and equipped with a fake door bell). Leaving his buyer in the stairwell, the seller fumbles with a key in the lock of the false door. Then he enters the "apartment" and, a short while later, returns, only to explain that for one plausible reason or another he cannot invite you in right at the moment ("unexpected guests have arrived"). He offers to bring you the item (after you have handed over the money, of course) in a moment. In pleasant and impatient expectation of your long-awaited purchase, you give him the money and wait for as long as it takes for you to realise that you have been tricked. The trickster, meanwhile, has disappeared through the false door and is already far away. You may be approached with an offer to buy some expensive item among your personal possessions, e.g. your video-camera, watch, camera etc. Here you should watch out for a simple, but highly effective trick which has become a part of the traditional repertoire of the Russian fraudster: the substitution of a low-denomination dollar note for a high-denomination one (e.g. a 1-dollar for a 100-dollar note), made possible by the fact that one side of different denomination dollar notes is always identical. Paving for his purchase, your buyer pulls from his pocket a stack of dollar notes which has been folded in two and fastened with a rubber band (or placed in a cellophane bag); moreover, the side of the notes showing their denomination is facing downwards. He gives you the opportunity to inspect and count the money. Then, upon a pretext of some kind, he takes the dollars back, and simultaneously your attention is distracted so that you are unable to follow his movements. At this moment the fraudster imperceptibly substitutes the stack of dollars which you have counted with another stack, identical in size, but made up of lower-denomination notes (usually, 1-dollar notes). This stack has been prepared in advance and is folded in half and fastened with a rubber band, just like the first stack. The inexperienced eye will be unable to notice that a swap has been performed. At this point payment is made, the buyer takes possession of the goods, and the "deal" is over.